This month’s Regional and Seasonal Challenge from Tandy over at Lavender and Lime, is to cook with rocket. Rocket and Rucola (Italian) is also known as arugula, roquette, rugula and is popular in Italian cuisine, it’s an aromatic salad green. I love it’s peppery, mustard-like flavour, and is great just with a dash of virgin olive oil, and grated shards of parmesan cheese, settled on a tenderloin. 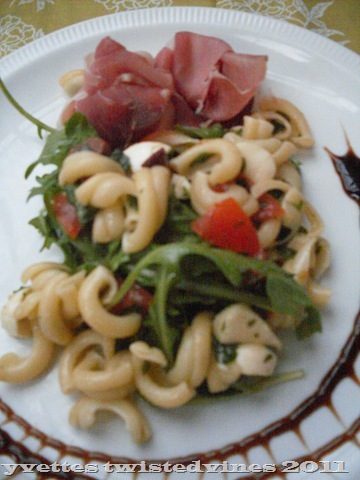 This recipe is one of my favourites however…Rocket Pesto and Pasta Salad served with Prosciutto and a Balsamic Glaze. Combine and chop 1 packet (125 grams) of fresh rocket, 1 big bunch of fresh basil, 1 clove of garlic, 6 heaped tablespoons of parmesan cheese and a handful of pine nuts, while mixing drizzle in 3 tablespoons of extra virgin olive oil. In another bowl, wash,cut into quarters and scoop out the middle seeds of 1 punnet of cherry tomatoes. Add 12 kalamata olives seeded and cut into quarters then add about 8 baby boccoccini of mozzarella. Season with salt and freshly grounded black pepper. 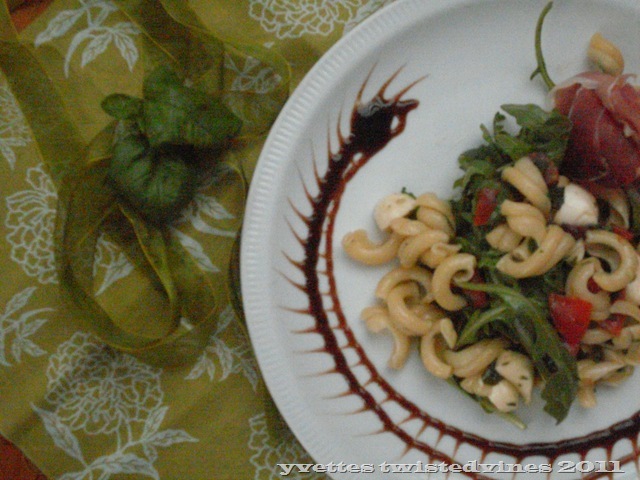 Add the cooked pasta to rocket pesto. 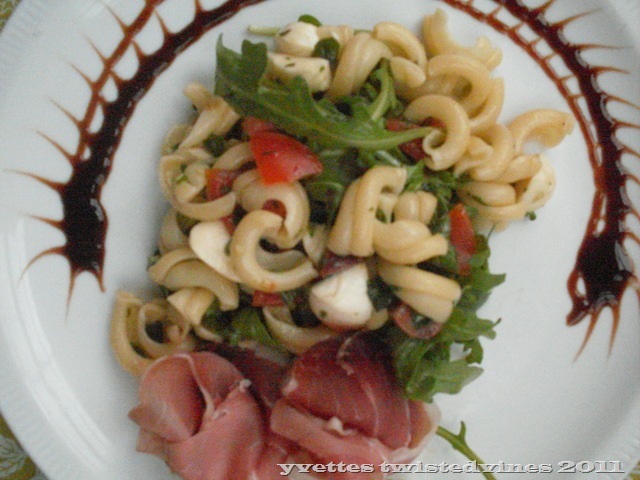 Serve on a bed of fresh rocket with slices of prosciutto and a drizzle of balsamic glaze. There it is..a delicious tasty pasta salad. Enjoy! This looks lovely. I love rocket and Parma ham. Thanks for sharing. This hits all of the right notes for me. Great recipe! What a gorgeous salad, Yvette! The presentation is beautiful with the fancy artistic sauce arch…I would love to have that put in front of me. It sounds wonderfully delicious. Your years in Italy certainly fed a big part of your soul. What an incredible recipe Yvette! I love rocket but ours is all finished now…woder if I can “force” some inside the house over the winter? In the meantime can just imagine I am eating your lovely dish! This looks delicious!! I love rocket and think this recipe is great!! Sounds delicious! I like all the ingredients that go into it, especially prosciutto!